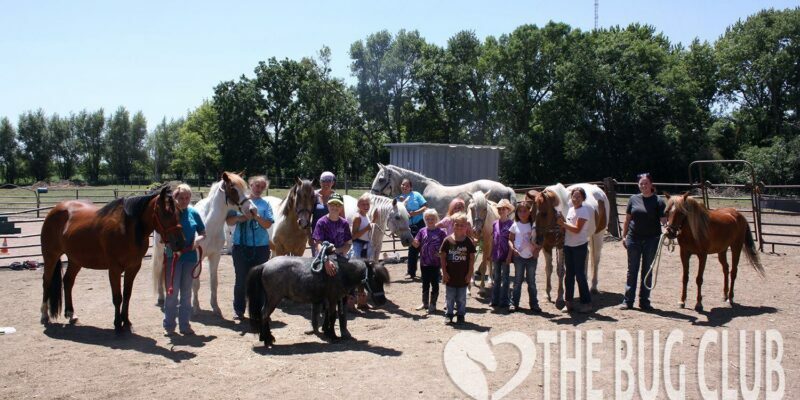 The Bug Club of Gentle Spirit Horses Rescue & Sanctuary is a club for our younger visitors ages 3-13. The Bug Club promotes responsible horsemanship through online and hands-on education to potential future horse owners and supporters. At our first Open House in October of 2015, many families made the trip to Humboldt solely because Keloland news listed us on the "Saturday Boredom Busters" page. Coaxed by free pony rides and the ability to expose their children to horses, many for the first and only time in their lives, we realized quickly there was a need in the community for some kind of Kid's Club for horses that was affordable and educational. Lessons can be expensive, at $35-50 a lesson, and are simply not the best choice for some families. Being a part of a child's first experience with a horse is a gift, and we often refer to the tiniest of kids looking like "bugs" when getting pony rides on our big horses, so the name "Bug Club" came to mind and it stuck. The Bug Club is an educational membership based group for children between the ages of 3-13. Any child can join The Bug Club as an Online Member and receive access to the monthly online activities and contests. For a small additional fee, children can become Hands-On members and join us for monthly Hands-On activities at our Humboldt, SD location, to participate in horse activities that relate to the monthly topics. Occassionally there will be bonus Hands-On days that any member, Online or Hands-On, can attend. A Bug Club T-shirt and carry bag can be ordered. Hands-On Memberships are $36 annually, and renew every January. The membership allows your child to attend up to 8 Hands-On Activity Days with our horses. Hands-On Memberships help support the care of our Bug Club Ponies Cola and Comet. Additional T-shirts can be ordered for $15. One time Activity Day passes can be purchased for $5. Limited scholarships available for families with financial need, contact us for information. If you are interested in a Hands-on Membership, first sign up for the newsletter and then send an email to nina@gentlespirithorses.com with the names of the children you would like to sign up for. We will send a paypal invoice to get you signed up. The monthly email newsletter will tell the Hands-On date for the month and we will post it on the GSH Facebook page.